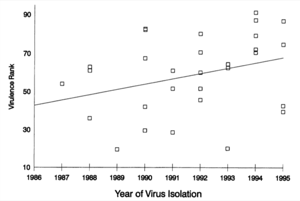 I’ve observed before that the common belief that viruses evolve toward avirulence is not particularly true. It’s more accurate to say that viruses evolve toward improved transmission. Some viruses are better transmitted if they let their host survive longer, but other viruses have to be virulent in order to spread. The former may evolve toward reduced (though not necessarily loss of) virulence, but the latter would “want” to maintain stable virulence. What about increasing viral virulence? What could drive that? There’s at least one fairly well-documented example of that. The increase in virulence is probably because of a change in the virus’s environment thatÂ forces the virus to become more virulent in order to continue to transmit efficiently. Ironically, the environmental change is vaccination. As far as I know — I want to put this up front, to forestall the vaccine loons — there’s no instance where this has happened with a vaccine used for humans. 1 I’m talking about a chicken vaccine, for Marek’s Disease. But the 99% protection rate didn’t last long. Losses began to creep up once again, as more virulent viruses arose. New vaccines have been introduced a couple times; each time losses dropped, but then once again new and increasingly-virulent viruses arose. Marek’s Disease viruses isolated today are far more virulent than the relatively benign viruses of the 1960s and early 1970s; the original vaccine is essentially useless against them. This evolution is actually very reminiscent of the myxoma/rabbit co-evolution story I’ve talked about, here and here. Australian rabbits have evolved to become much more resistant to myxoma virus than their European cousins. In this case, MDV is more analogous to the rabbits than to myxoma — evolving mechanisms to persist and replicate in the face of a lethal challenge (for the rabbits, myxoma virus; for Marek’s Disease virus, the vaccine-derived immunity). 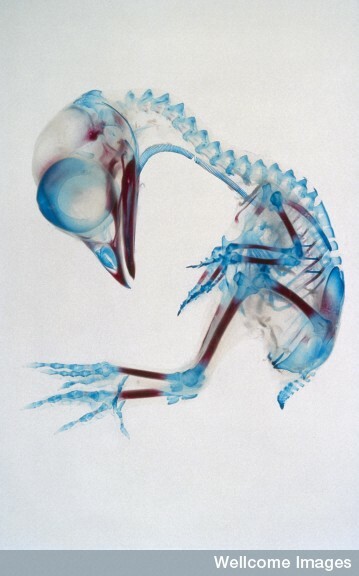 Before rabbits could evolve resistance, there had to be some survivors of myxoma infection. 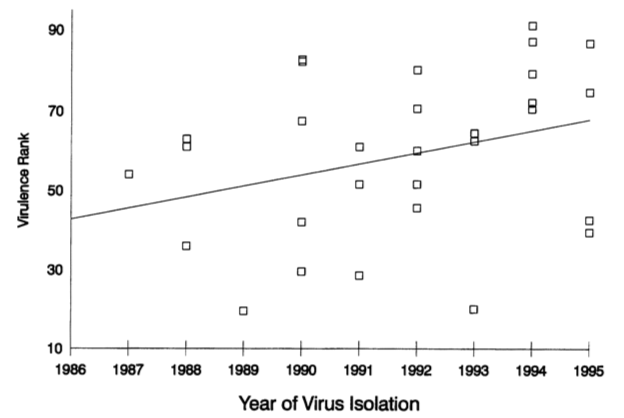 In that case, myxoma virus itself evolved to become somewhat less virulent (70-90% lethal, instead of 98%). In the Marek’s Disease story, a key factor is that the vaccines all suck3 in their ability to actually prevent infection; they prevent the disease, but viruses can still infect vaccinated birds, although the virus replicates slower (which reduces transmission). This probably isn’t the whole story (there’s some evidence that the virus was already evolving toward increased virulence even before the vaccine was introduced — perhaps related to changes in its environment brought about by factory farming), and the mechanisms underlying the changes in virulence are not known, but the solution would seem to be clear: Develop a Marek’s Disease vaccine that will induce sterilizing immunity, as do most vaccines used against human viruses. That way, there’s no survivor virus that can act as a seed for evolution of virulence. This entry is filed under Evolution, Science, Vaccines, Virology. You can follow any responses to this entry through the RSS 2.0 feed. Both comments and pings are currently closed. I don’t think Varivax (the anti-chicken pox vaccine) prevents infection. Its FDA approval is based on a reduction of serious infections. Not the overall number of infections. Vaccinated kids still get chicken pox, but they get far fewer lesions and are far less systemically ill. I had never thought about the issue you raise here before (possibly because I’m not a virologist or an immunologist)… but this actually raises a red flag around universal vaccination against varicella. Are you sure about that? I thought it does prevent infection with wild-type virus. In general herpesviruses don’t superinfect well (though it does happen) and since the vaccine virus establishes its own persistent infection I’d expect that superinfection with wild-type virus would be rare. If I’m interpreting a number of papers correctly, this is correct — superinfection with wild-type virus does occur but it’s unusual, a few percent, and associated with reduced disease — but almost everything I find does look more at disease than evidence of infection. Testing for superinfection would probably be very difficult, because you can’t use the usual seroconversion measures; you’d have to actually sequence out virus and confirm that it’s wild-type and not vaccine strain. I believe that it’s this technical difficulty that’s led to the FDA definition of preventing disease rather than infection. The occurence of virus cannot be avoided bu the spread of virus can be prevented. There are a lot of causes and effects that may occur in different age group. The best treatment is having a clean and secured environment together with proper hygiene and healthy foods. Keep in mind that a lot of people may not easily understand the how virus occur.